Brugmansia sanguinea, the Red Angel's Trumpet is a small, 4 to 12 feet tall, perennial shrubby tree native to Peru and the Andes. Brugmansia is a fast grower. It is closely related to Datura, belonging to the same nightshade family, solanaceae. Brugmansia blooms dangle like great trumpets or bells from the large shrubs and range from 7 to 14 inches long, depending on the species. Datum blooms, also large, stand erect. 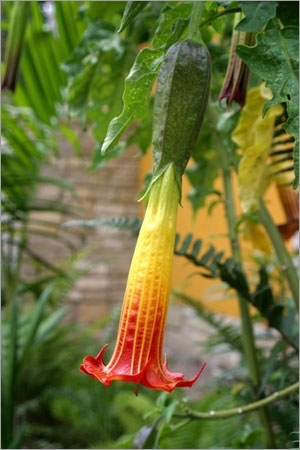 Brugmansia may be grown in containers or in the garden. The plant is commonly grown as an ornamental for its flowers. The most spectacular flower display of the genus. The flowers are 8 to 10 inches long, trumpet shaped, pendulous, brilliant orange-red at the mouth with yellow veins, and fading to yellow at the base, not fragrant. 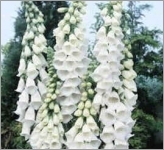 It makes an extraordinary display in late Spring through Summer, but can bloom for most of the year. They are borne in abundance, up to 40 at a time. The stem is erect and branching. Plants require minimal pruning, simply removed old flower heads, although plants can be cut back to base during Spring to rejuvenate every few years. It requires cool Summer and cooler nights to bloom. Leaves are 7 inch long, ovate, shining green on the upper side. The fruit is top-shaped, spineless, 3.5 inches long. All plant parts are highly poisonous and should never be injested.